I'm not generally a fan of candy corn, but I heard about this mix tasting like a PayDay candy bar and had to try it. Guess what! It really does! Just make sure each bite contains both peanuts and candy corn. Now I buy a bag of candy corn every fall, just to make this mix. 2 ingredients. Effortless to make. Easy peasy lemon squeezy! Please visit Tempt My Tummy Tuesday and Tasty Tuesday for more great recipes! My mom loves this mix -- we had it all over our house when I was younger. I've started having paper and pencil ready when I come visit you!! Love it! I keep seeing this and I need to get all the stuff to make it! I love paydays, will have to try this mix, sounds good ! Oh I like that idea!! AND, hubby LOVES candy corn. Thanks. man, my kids LOVE candy corn! Tis the season! Thanks for sharing! 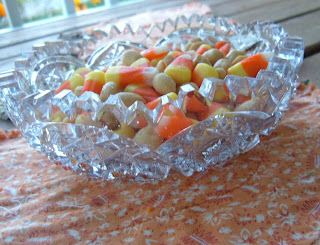 oh yeah; I also saw a recipe with chex mix (party mix) and candy corn. Might be interesting too.